Apexity Inc. agrees to sign over all rights associated with ownership and usage of materials developed by Apexity to the customer upon receipt of final payment for said materials. Until that time Apexity retains and reserves all rights to any content created by Apexity as set forth by the Copyright Laws of the United States of America (Title 17 U.S.C., et seq., and the Digital Millennium Copyright Act). Once full payment is received by Apexity, all rights to the final product, full and unrestricted, will be released to the customer for use in all media, in all markets, for unlimited period of time. Apexity retains and reserves the rights to use any and all content developed by Apexity, regardless of ownership, for display and self-promotional purposes. intellectual and proprietary materials utilized in developmental stages. The initial fee is non-refundable and does not include final usage rights, which will be released upon receipt of final payment. Customer's final product will be made available and full usage rights will be granted upon final approval and payment. 2. If the project scope is extended during the initial order fulfillment, Apexity may secure intermediary payments in amount agreed with the customer, but not exceeding one half of the additional purchase amount. The intermediary fees are non-refundable and do not include final usage rights, which will be released upon receipt of final payment. 3. Upon the customer's approval of the final product, Apexity will secure a final payment. Upon receipt of final payment, all rights to the final product, full and unrestricted, will be released to the customer for use in all media, in all markets, for unlimited period of time. 4. Customer can choose to terminate their project at any time. In this event, no additional charges will be collected by Apexity. The customer retains no rights to any of the design work we have completed for them, and Apexity retains full ownership of all work completed on the project. Initial design concepts will be presented within 3-10 business days following the receipt of your order and down payment, depending on the service ordered. Revisions are made within 2-10 business days, depending on the service ordered. The final product will be delivered by electronic means in 1 business day upon receipt of the final payment. 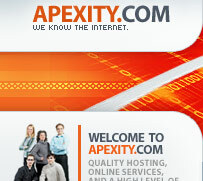 Apexity provides no guarantee of copyright to customer. Customer assumes responsibility of obtaining Trademark or Copyright of any material created by Apexity Inc. Apexity assumes no liability in the event that customer is unable to obtain Trademark or Copyright of said material for any reason.